Do you know what took me to Taj Mahal? The meaning I gave to love took me there! Yes that was the only reason! For such a romantic person like me being in front on that monument was something unbelievable! I still remember the sentence I have pronounced when I finally saw it: Oh my God someone made it for love! Yep, probably most of you have never heard about Taj Mahal, it is one of the Seven Wonders of the World which represents love. At the ticket office there were two queues, one for Indian nationalities and one for foreign nationalities. Of course the fees were different; Indians pay around two euros while the rest pay around twelve. I paid my €12.00 and it was fine for me because queueing with all those Indians meant a great deal of time. They never wait patiently for their turn and they push and pull each other in order to take the lead. I saw locals arranging a short cut to buy tickets for foreigners for about 250 Rs a person through the south entrance. It could be Worth, you can really save up to an hour because most of the times Taj Mahal is crowded so the line is very long. There are no entry fees for children under 15. Until that moment I have heard only the romantic part of its story but that day I learnt that it was not only the symbol of eternal love of an emperor for his favorite queen. There was much more beyond! While I was walking around and watching it standing majescally on the banks of river Yamuna, I couldn’t' stop thinking about the cruelty of its history. It was commissioned in 1632 by the Mughal emperor, Shah Jahan (reigned 1628–1658), to house the tomb of his favorite wife, Mumtaz Mahal, a Persian princess who died giving birth to their 14th child at the age of 38. Soon after the Taj Mahal's completion, Shah Jahan was deposed by one of his own son who put him under house arrest at nearby Agra Fort from where he could see Taj Mahal! It is said that he cried every single day before dying. Upon Shah Jahan's death, his son buried him in the mausoleum next to his wife. The tombs are the central focus of the entire complex of the Taj Mahal and they are located in one of the few accessible area of this building. The Taj Mahal is a fine example of how to plan and then successfully apply symmetry into the proceedings. In fact every inch of Taj Mahal is a breathing example of it, except the tomb of Shah Jahan himself, which is an afterthought. I came to know that those who involved in construction have been mutilated upon Shah Jahan’s order because he wanted the structure to be unique, non-replicable! It is also heard that to prevent the craftsmen to witness any other beautiful object than Taj Mahal, Shah Jahan ordered to take their eyes out of their sockets. Could it be true? Then where is the romanticism in this place? Anyway there are no historic writings that mention any such thing happening, so probably it could be a myth. There are so many stories about Taj Mahal and among all those, one of the popular is that it has been constructed under the supervision of an Italian Architect, Geronimo Veroneo. Until now nobody have been able to prove it. I was pleasantly surprised to see that Taj Mahal was very clean outside with shiny marbles. When I tried to poke into the locked rooms through the windows I saw plenty of filth inside. I understood that they keep clean only the area which has access to public. Thousands and thousands of tourist are visiting this place daily and I wondered myself if they don’t have enough income to keep it tidy. In any case worth a visit! The impression is WOW, what a monument!!! What a history!!! Remember that a good 3 hours will do! It is closed on Friday. Taji Mahal! I've never been there! But I would love to visit indhia and visit Taji Mahal one day. Thank you for an inside story about Taji Mahal. I didn't know another story about Taji Mahal but the wife. It's really intersting!! Along with romanticism, Taj Mahal also has so much cruelty in it's story. It is such a beautiful piece of work. It's terribly crowded though. Worth going early in the morning to avoid being squished and pushed. I have learned about Taj Mahal in grade school. Yes, we were taught in school about this monument that was built for the wife of an emperor. Like you I find this fact quite interesting. I mean, we know people who have done so many stupid/great things for love, but how many people do we know who actually built an entire building just to place the remains of his love. There's a big difference with the rate for the locals to the visitors, but I can definitely understand. But as you, if I were a local and I see people pushing each other on the line, I'd rather pay more than be there. And I'm quite surprised to hear about the gruesome tales surrounding this monument. I just hope that they're not true. Hopefully I'd be able to visit Taj Mahal someday. As an Indian, I am amazed how fascinating Taj Mahal is for all. The construction of the monument is brilliant and an inspiration for generations of builders. When i look at the story behind the Taj,I personally dont blame anyone for it because those were different times when kings had to rule in a certain manner and had to stay ahead of its cousins and used to adopt sinister ways at times. It is indeed a sign of love with a not-so-lovey dovey story attached to it. However, the contrast is what makes it so fascinating. The entire blog post is really fascinating ! 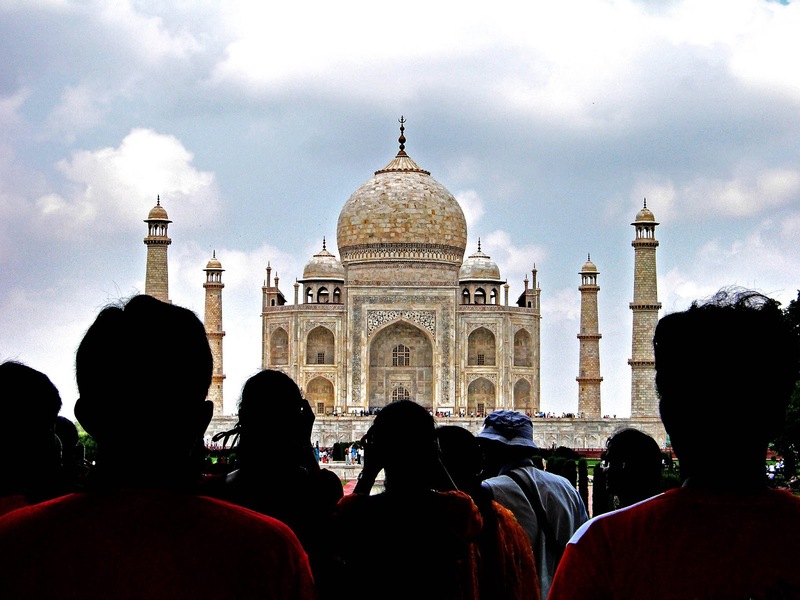 There are plenty of controversies around the Taj Mahal but so is the case with a lot of monuments across the world. Some things are just lost with time. The best time to enjoy the Taj Mahal is at Sunrise when there is hardly any crowd. I got some perfect shots of the Taj during then. It's incredible to witness the work of great love! And it feels really good to be loved!!! Taj mahal will always give me this sense... i think ill lose my breat if i arrive this world wonder!!! I too have read plenty of controversial stories regarding Taj Mahal but nothing has been proved. The only theory which puts me in doubt is - why did he remarry immediately after Mumatz Mahal death, if she was that beloved? Anyways its an architecture marvel and I love seeing it. I want to witness it on the full moon light. I like the shot from behind the people's heads.